Seismic stability analysis is an integral part of the design of municipal solid waste (MSW) landfills in the areas of high seismic activity. The conventional pseudo-static methods were used to calculate the factor of safety of MSW landfills. However, these methods didn’t consider the mode change behaviour of the landfill, amplification acceleration of the ground motion and also, neglected the damping properties of MSW. The objective of the present study is to develop an integrated methodology that gives the seismic acceleration profile in the landfill as well as the factor of safety and yield acceleration values for a typical side-hill type geometric configuration. Strain-dependent dynamic properties (shear modulus and damping ratio) of MSW are computed through an iterative scheme and the same shear modulus and damping ratio are used to calculate the seismic factor of safety of landfills. Amplification of base acceleration is observed at low-frequency input motions. 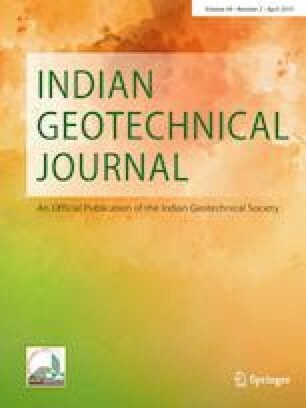 The maximum shear strain generated in the landfill is significantly higher for low-frequency input motions, since, at lower frequencies, the seismic inertial forces at all depths are in phase. Whereas, at higher frequencies, those are out of phase. The factor of safety values computed using the present method are on the higher side when compared to the conventional pseudo-static method of analysis for certain combination of input parameters.